If you spend time on Pinterest or any blogs featuring crafts to make your house more chic, you’ve probably seen this trend: big, lighted marquee letters for the backyard. Although this DIY project may look difficult, it’s really not too hard — all you need is an afternoon and a few simple supplies and you’ll have these DIY marquee letters as a new, exciting backyard decoration! Once you’ve gathered your supplies, lay the plywood down flat and begin to map out how you want your letter to look. You may think “the bigger, the better,” but be sure your light socket string will be able to cover the size of your letter. Use your marker to draw the letter and give yourself a guide when cutting later. Don’t worry if you make any mistakes or decide to change the size of your letter mid-way through — this will be the back of your DIY marquee letter, so no one will see what you did in this step! Now, use your jigsaw to carefully cut out the letter along the guide you made for yourself. Once your letter has been cut out, it’s time to start planning where you want your bulbs to go. Use your marker again to map out a location for these bulbs so you know where to drill. Then, take out your power drill and make holes along your guides, ensuring that the holes are large enough for the light sockets to go through. As soon as that’s complete, you can spray paint your letter whatever color you’d prefer. Some people love gold for a classic look, but this is the time to make your decoration your own, so choose any color you’d like! After the paint has dried, arrange your light socket string into place and secure with hot glue. Then, screw your LED outdoor light bulbs into place and hang your new decoration! To easily ensure that the marquee light is lit each evening, we’d recommend putting it on a photo-controlled device, which turns on as the sun sets and automatically turns off when the sun rises thanks to its light-sensing technology. This project is so easy, it’s quickly become one of our favorite LED light bulb projects, and we hope it’ll become one of yours, too! Leave us a comment with your tips or tricks to make this project even simpler! 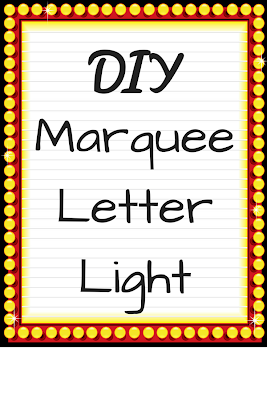 You have shared a great idea about Marquee Letter Lights. It is very useful for making a Light Letter board easily. We’re All Light is the best shop in Sydney where you can buy the latest designed Lights letters at the cheap price. Thanks for sharing the post with us. If you are looking for the electrician services then, Commercial Electrician Springfield MO who provides the electrical installation services. Thanks for sharing the post with us. If you are looking for the LED lights installation services then, visit grow shops near me who will provide the proper growth of plants. LED lights are now being used for the growth of the plants also. Even, you can easily save you money. Visit Nanolux online store south Africa for the installation services of led lights.